You could spend the rest of your life burning through online marketing content. There is no shortage of information. There is no shortage of quality content. There is certainly no shortage of marketing tools. And yet, as a marketing consultant, I’ve found that most website owners are struggling with 1 of 2 problems. 2. Or they are great with tools but don’t know how to utilize those tools to execute a broader strategy. In this article, I’m going to solve both of these problems for you, showing you how to use Crazy Egg’s heatmaps and Majestic’s tool suite to create a targeted backlink campaign with less than 30 minutes of work. Identifying your target customer is square one for any business. No tool can identify that for you. Click here for help identifying your target customer. Understanding your existing audience, however, can ONLY be accomplished with the use of analytics tools. What pages are visitors visiting? What links are they clicking? How are they interacting with your webpages? Google Analytics is a great starting point for website analytics, but it can be difficult for the average website owner to read or interpret. It also can steer you towards inaccurate conclusions, as over 50% of web traffic comes from bots. Most importantly, it fails to give you a simple visual of visitor activity on your site. Crazy Egg’s heatmaps tool is designed specifically to solve these problems and fill in the gaps. 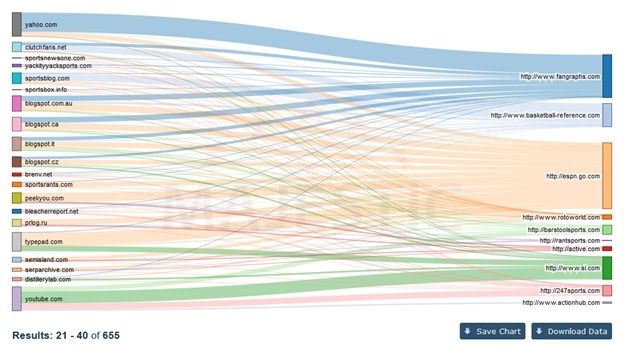 It offers a highly visual display of how actual visitors (not bots) are engaging with your site. To demonstrate, I’ll be using shots from a recent client, PlaySportsTV. The site offers a variety of sports instruction packages, so my first goal was to identify how current visitors were engaging with the site. 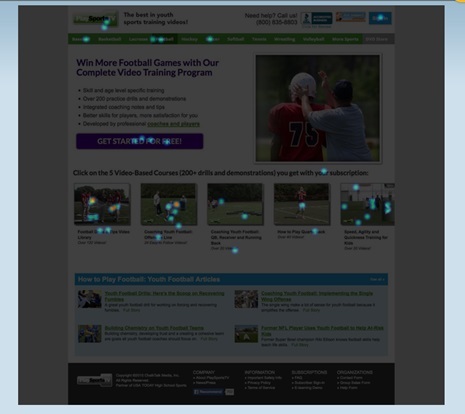 As you can see, Crazy Egg shows exactly where visitors are clicking on the site. From this display, I was able to see that the most popular topic, by far, was football. While this wasn’t surprising, since we are currently gearing up for summer football camps and the start of the upcoming season, it confirmed that PlaySportsTV’s audience was, in fact, in harmony with overall sports trends. The more surprising insight was that soccer was the 2nd most clicked category link. The site is primarily targeted at a US-based audience, and while soccer is certainly popular, we were not expecting it to be #2 in category engagement. Using Crazy Egg’s Confetti View, we were further able to identify that over half of our home page visits were coming from our on-site content pages, rather than directly from search engine queries. The #1 purpose of content marketing is to get targeted visitors engaging with your site and ultimately converting. By confirming that visitors were transitioning from content to our home and sports-specific landing pages, we knew that our content marketing efforts were paying off and should be scaled up. As you may have noticed, however, not many visitors are actually converting to the free trial from the home page. In this case, that was expected, but it meant we needed to see what was happening once visitors reached our sports-specific landing pages. As you can see, the Crazy Egg heatmap showed us exactly what we needed to know. Using the supplemental analytics data the software provided, we were able to determine that this page was converting 10% of new visitors! That’s a pretty epic conversion rate, particularly in this industry! 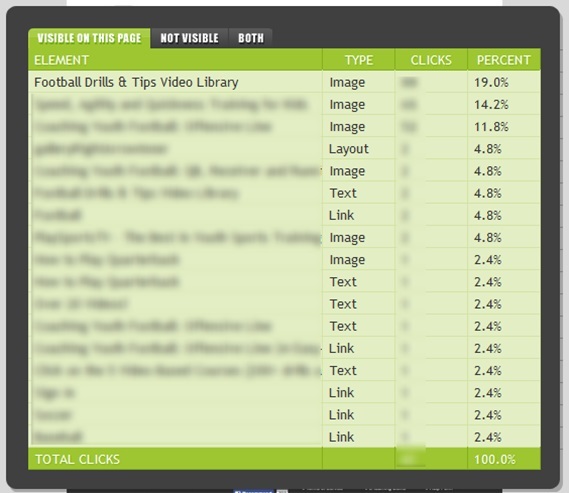 Plus, another 72% of visitors were engaging with our instructional content. Using Crazy Egg’s List View, we were able to determine exactly which topics were most popular. As you can see below, the top 3 topics made up 45% of total engagement. While this data was collected over several days, setting up and reviewing these tests took less than 15 minutes. And now we have a crystal clear view of where our content and backlink keyword focus should be over the next month. And more specifically, the top 3 football topics from the above image. I’ve kept the 2nd two blurred for client confidentially purposes, but we’ll be using the top result – football drills & tips – for the next stage of this guide. Before we move on, I want to point at that many website owners make the mistake of assuming they understand their audience. While it’s always possible you’ll get lucky, there is literally no reason to guess when you can use extremely low priced tools like Crazy Egg to identify EXACTLY what your audience is doing. Now that we understand the type of content we should be producing, it’s important to identify WHERE we should be targeting it. Many website owners falsely believe that content marketing = creating great content. That’s like saying 2 = 4. Content marketing = creating great content + putting it in front of interested audiences. Once we’ve created our epic content on football drills, we need to find existing audiences that will eat it up. We need to find web properties with a good backlink profile that have already accrued our target audience in one spot, and then we can present our content to them. This is where Majestic’s suite of SEO tools comes into play. More specifically, I’m going to highlight how 2 tools – Clique Hunter & Bulk Backlink Checker – can help you identify targets for your content in under 15 minutes. Continuing the PlaySportsTV example, our first objective is to find a list of top sports sites. There are a number of ways to do this, but for the purposes of this test, I just Googled “top sports sites” and aggregated a list of domains. The next step is to prioritize these sites based on authority, but also based on relevance to the sports genre. Fortunately, Majestic has a unique tool called Bulk Backlink Checker that allows us to rank sites based on something they called Topical Trust Flow. 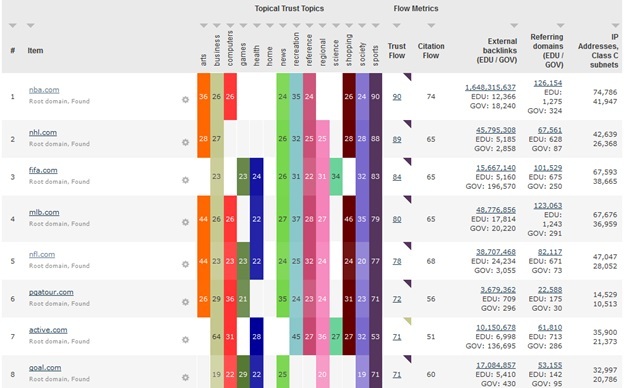 Using this data, we were able to quickly rank 150+ domains by topical relevance, highlighting targetable sites that had a higher-than-expected Trust Flow. Accordingly, we put our top writers on creating a few high-quality articles to pitch to these target sites. We were able to get our first backlink from an Alexa 4,000 site within the week. The above method was a great way to target a few top-level backlinks and place some great content in high-traffic areas, but you are only going to score with a handful of sites at this level. It’s a numbers game, and the bulk of our success won’t come from the sites EVERYONE is linking to. Instead, our success will come from the EVERYONE’s linking to those top sites. We need to identify who is linking to these top sites. If they are already linking to sports content, we can create some content of our own they will want to link to. Majestic’s Clique Hunter tool was made for this exact purpose. Accordingly, we selected the most relevant 10 sites from our Bulk Backlink Checker results, and did our Clique Hunter comparison. The above image is a visual display of what this tool does. It pulls up every website that has linked to 2 (or a number of your choosing) of the sites entered. 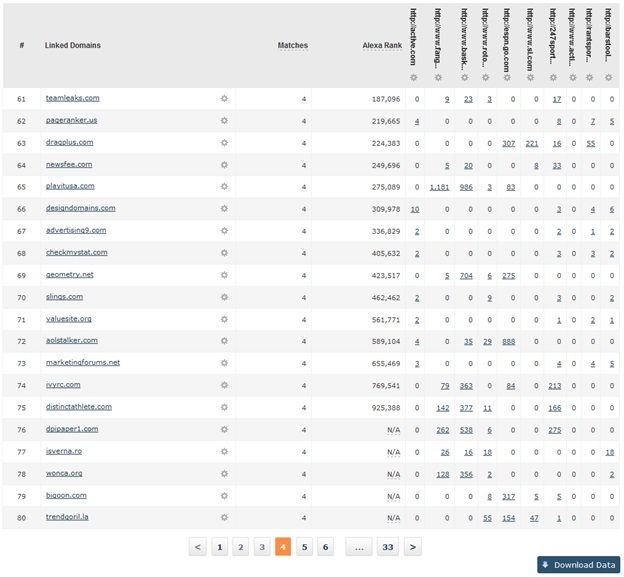 In other words, it allows us to see any website that has linked multiple times to our target sites. It also allows us to find blogs that link to our competitors. By creating content even better than the content these sites link to, we can essentially “steal” their links. Here we have 33 pages worth of potential content and backlink targets, which can be downloaded as a CSV file for easy analysis. These sites can be loaded back into the Bulk Backlink Checker to and sorted by Sports Trust Flow in order to get a list of prime targets for you content campaign. Planning out a backlink campaign doesn’t have to be hard. All you need is the right tools and an understanding of what you’re doing and why you’re doing it. In this example, we were able to grab 100+ quality & accessible targets for content placement and backlinks to PlaySportsTV. You can follow this exact formula to achieve similar results with your business. With the right tools, it takes less than 30 minutes! coordinated content marketing, and cutting edge web design. In addition to reading exceptional books and WAY too many blog articles, he enjoys pretending to think in his spare time. Connect with him on Twitter @jmcmillen89.